Last month, the Schweizerische Nationalbank (SNB), the nation’s central bank recorded some large ‘book’ losses after it had abandoned its attempt to stop the Swiss franc (CHF) from appreciating against the euro. It started trying … as a way of protecting its manufacturing sector but abandoned the strategy on January 15, 2015. It had been buying euro in large quantities with francs and on April 30, 2015 the SNB released the – Interim results of the Swiss National Bank as at 31 March 2015 – which showed that its first-quarter 2015 losses were 30 billion CHF or around 29 billion euros. They lost CHF 29.3 billion on its “foreign currency positions” and CHF 1 billion on its gold holdings. This has raised the question, once again, whether central bank losses matter. The answer is always that they do not matter at all given the central bank can never become illiquid as it issues the currency (under some arrangement or another). So the commentators who whip up a lather about impending doom arising from central bank bankruptcies are to be ignored. But central bank officials also publicly express concern about their capital holdings. Why would they introduce that concern into the public domain when they know full well that they cannot go broke. The answer is that they are politicians themselves except they evade democratic scrutiny and election. On 15 January 2015, the SNB decided to discontinue the minimum exchange rate of CHF 1.20 per euro with immediate effect. This led to an appreciation of the Swiss franc and, as a result, to exchange rate-related losses on all investment currencies. For the first quarter of 2015, these amounted to a total of CHF 41.1 billion. The CHF 41.1 billion was offset somewhat (down to CHF 29.3 billion) by interest and dividend income, and price gains on bond and equity holdings. 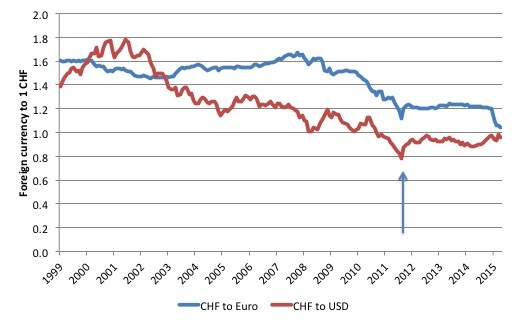 In September 6, 2011, the SNB introduced the exchange-rate peg because it believed the CHF was overvalued against the currencies of its trading partners. The January 15, 2015 – Decision – by the SNB to both break the peg of the Swiss franc to the euro and cut its interest rate on sight deposits to -0.75 per cent signalled the surrender by that nation to the reality surrounding its borders. The interest rate decision was required after it decided to scrap the exchange rate peg, given that it didn’t want a credit crunch killing the domestic economy. This is what happened (using daily data available from the – SNB). The data goes up to yesterday (May 27, 2015). This is a longer-term view (using – Monthly SNB data) and an appreciation is a fall in the graph (given the way the data is arranged). The arrow shows the appreciation that particularly against the USD but also the yen and the euro, which led the SNB to impose the peg on September 6, 2011. At the time, it was clearly a decision aimed to protect the export sector, which is the largest as a percentage of GDP in the world (around 73 per cent, compared say to South Korea (54 per cent), Germany (46 per cent), China (27 per cent), Japan (16 per cent) and the US (14 per cent). At the time, the SNB released a press statement – Swiss National Bank sets minimum exchange rate at CHF 1.20 per euro – which said it was “prepared to buy foreign currency in unlimited quantities” to reduce the value of the CHF. In other words, it acknowledged its currency sovereignty and its capacity to create “unlimited quantities” of it to pursue its stated goals. 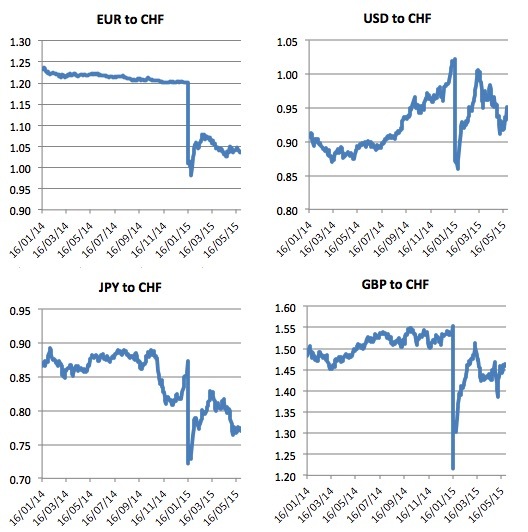 As the graphs show, the decision clearly stabilised the CHF against the euro and the US dollar. Of course, the operations associated with the strategy increased the SNB’s holdings of foreign currency reserves (particularly the euro). The arrow marks the announcement in September 2011. You can get the data – HERE. Some might think that the SNB balance sheet looks very similar to that of the US Federal Reserve, or that of the Bank of Japan, or the Bank of England for that matter. The answer is that the SNB wasn’t engaged in Quantitative Easing, which we understand to be the purchase of sovereign bonds in exchange for bank reserves. Rather, the SNB was buying the currencies of other nations in exchange for francs and so the valuation of its reserve holdings are highly exposed to movements in those currencies. The first-quarter 2015 SNB results now reveal that the massive holdings of foreign currency reserves, particularly euros has resulted in ‘book’ or ‘paper’ losses on their foreign currency holdings (as the exchange rate appreciated). One argument at the time (January 2015) was that the SNB abandoned the peg to minimise these losses given that the ECB was about to embark on a massive QE exercise itself, which would drive the euro down in value against the CHF. At the time I did not support that interpretation. 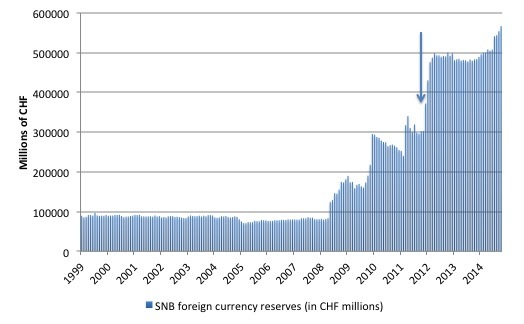 The SNB has no need to be concerned about these paper losses given it is the currency-issuer. Unlike a private bank, the SNB could operate with permanent negative capital. Please read my blog – The ECB cannot go broke – get over it – for more discussion on this principle. While the central bank officials would hardly acknowledge the logic in that blog in public, they know it to be true and would hardly have made the decision on the basis of the myth that they can go broke. At the time, I guessed that the SNB realised that with such a conservative fiscal position being run by the Swiss government and policy austerity surrounding its borders that deflation is inevitable and that they may as well return to a more normalised position (historically) now before the ECB changes its strategy. I continue to hold that view. There was a recent Op Ed article in Money and Banking (May 26, 2015) – Do central banks need capital? – which bears on the topic of SNB losses. They use the SNB case study to explain why central banker governors posit public positions that are in total contradiction to the position espoused by “monetary economists”, the majority of which when asked “whether we should care if a central bank’s capital level falls below zero (even for an extended period of time) … will say no”. The answer of the “central bank governors … in nearly every case will be yes”. The economists correctly argue that central banks are fundamentally different from commercial banks, so they can go about their business even if they have negative net worth. However, central bankers know instinctively that the effectiveness of policy depends critically on their credibility. They worry that a shortfall of capital would threaten their independence, which is the foundation of that credibility. In other words, the public concern for central bank losses is about politics and has nothing intrinsically to do with financial or economic concerns. That is an important point to understand. The former is contestable while the latter is just the fact (in this case) – central banks can never go broke and therefore what capital stock it holds is moot. 1. “a central bank can issue liabilities regardless of its net worth. It can never be illiquid”. That is categorical and means that all the financial pundits that have been predicting the US Federal Reserve or the Bank of Japan or England would face bankruptcy are not worth reading. They do not understand the topic they are discussing. Please read my 2010 blogs – The consolidated government – treasury and central bank and Central bank independence – another faux agenda – for more discussion on this point. So why would central bank governors give the impression that they need certain capital to asset ratios maintained. The authors note that the SNB losses on its foreign exchange dealings in the first quarter ammount to “about 6½% of Swiss GDP”, which has reduced the bank’s “capital and provisions below 10% of assets”. And as a monetary economist I just say – so what. … political concerns about the impact of even larger future portfolio losses … as any central bank governor will tell you, the real threat arising from episodes in which there are significant losses is political, not economic. Which raises the question of what politics are central bank governors engaged in? It is clear that the idea that central banks are independent from the political process is false. In most cases, the elected government officials (the politicians) appoint the senior officials at the central bank. In some cases, the government of the day can overrule the monetary policy decision from the central bank board if they feel it is detrimental to their own political agenda. One could hardly say that the senior officials at the Bank of Japan are adopting a cautious line for fear of political intervention. The Bank of Japan pioneered quantitative easing and its balance sheet is massively exposed to losses (for example, on the value of the public bonds it holds). But if it is worried about that ‘loss exposure’ then its current behaviour would hardly suggest that. So what are these “political constraints” on central bank independence? The authors note that one problem might arise from a failure of the central bank to remit profits to the relevant treasury. It is true that politicians occasionally come up with ridiculous ideas to have more direct control over monetary policy decisions. Changing a board or sacking a governor, much less overruling an interest rate decision would be a rather dramatic act of an elected government. There is clearly subtle pressure on central banks but not much overt intervention. The – Federal Reserve Transparency Act of 2015 – in the US is a case in point. The usual case for independence is that central banks can adopt policies that are beyond the political cycle which then provide stronger discipline on inflationary expectations. Allegedly, politicians can be easily swayed by increases in unemployment to introduce expansionary policies and not worry about the longer-term inflationary consequences because their political term is short. There is a big literature on the so-called time inconsistency problem in economics which seeks to analyse the problems of short-term thinking against longer-term threats. Mostly, the literature is just a sop to undermine the case for fiscal activism and democratic oversight. The research literature also does not unambiguously find that more central bank independence (of course there are huge measurement issues) brings lower inflation. The most comprehensive and rigorous work on the impact of inflation targeting is the 2003 study by Ball and Sheridan who aimed to measure the effects of inflation targeting on macroeconomic performance in 20 OECD economies, of which seven adopted inflation targeting in the 1990s. They used special econometric techniques (which are widely accepted) to compare nations that had adopted targeting to those that had not. Overall, Ball and Sheridan found that inflation targeting does not deliver superior economic outcomes (mean inflation, inflation variability, real output variability, long-term interest rates). One of the claims made for inflation targeting is that central bank independence and the alleged credibility bonus that this brings should encourage faster adjustment of inflationary expectations to the policy announcements. Ball and Sheridan found that there is no evidence that targeting affects inflation behaviour in this regard. I also considered these issues in this blog – Central bank independence – another faux agenda. An Modern Monetary Theory (MMT) insight is that there is little to be gained from artificially separating the two arms of macroeconomic policy making (central bank and treasury). The two have to work together on a daily basis in reality (the bank has to know what the treasury is doing with respect to deficits so it can manage liquidity and defends its interest rate target). Further, policy should have strong democratic oversight. I cannot vote to get rid of the RBA governor and the board even if they are running monetary policy that damages the economy (many times) because they are obsessed with the inflation bogey. It is clear that the SNB losses are largely irrelevant from an economic perspective. The fact that several central banks are holding Greek government debt also means that they could just click a few keyboard strokes and write them down to zero without no negative consequences at all. This would give the Greek nation a massive boost, along the lines of the debt forgiveness that was given to Germany in the post Second World War period. The losses of the write offs would have zero impact on the ability of the banks to conduct monetary policy and maintain financial stability. So given the gains are so large (for Greece) and the losses of no consequence why wouldn’t they do it. But then politics should be an arena of contest where we vote. So if central bankers want to play into this arena they should be subject to democrative oversight, which goes beyond appearing on a regular basis before the elected parliament. The reality is that there is nothing to gain for the citizenry from having central banks artificially separated from the elected government. There is a lot to be gained for the managers etc who can evade scrutiny and accountability while enjoying high salaries, lengthy and secure tenures and get to bully depressed nations like Greece around! OK, but if you merge the two (and I agree that should be done), important decisions are still going to be taken by some group of qualified economists (unless you want technical economic decisions and indeed technical decisions in other areas taken by politicians who know next to nothing about the relevant subject). Should all those technicians be “democratically elected”? Should every single civil servant and bureaucrat be democratically elected? There are all shades of grey here from, 1, having EVERYTHING decided by politicians who are pig ignorant for the most part to 2, having everything decided by technicians. Personally I’m happy with the existing system under which 99.99% of decisions taken by government every day are taken by technicians with politicians obviously having the right to overrule those decisions in extremis. As to decisions on stimulus, I’m happy (as are most people) to see a committee of economists take that decision, with politicians only overruling that decision in extreme circumstances. The ‘independent central bank’ idea has become a religious belief amongst economists (who lets face it are, for the most part, closer to scientologists than scientists). Unfortunately that belief is leading to the rise of the idea that the central bank should start spending money rather than just lending it or conducting asset swaps. In other words the elected representatives should be reduced in capacity further while the genuine power is transferred to unelected bureaucrats in an ivory tower somewhere. The trade treaties being negotiated behind closed doors achieve the same thing – more transfer of power to unelected bureaucrats than can override the electorate. It seems that corporatism is tired of having to buy politicians and is now implementing structures that cut out the middlemen – central banks run by people sympathetic to bankers and governments hog-tied with treaty agreements that allow corporations to overturn legislation they don’t like. The EU model is everywhere at the moment. If my classical history is correct then didn’t Rome do the same thing as it transitioned from a Republic into an Empire? The Troika in Europe should perhaps be called the Triumvirate. So really we’re just waiting for Augustus to turn up. No. The important decisions (i.e. the direction) is set by the elected members. The ‘qualified’ economists just execute the strategy – and really should just be civil servants since economists generally can’t find their backside with both hands. Which then is no different from the civil servants at the DWP executing the strategy of deciding who should and shouldn’t get benefits. Politicians can take advice from whoever they choose, but the elected individuals must make the decisions – particularly over what to spend money on. Otherwise you are sleepwalking into an autocracy. Modern elections ( going back many 100s of years now) are designed to give the serfs the illusion they are engaging in a democratic process. The Top down management we observe today is not I repeat not democracy. To call what we have now democracy is a perversion of language. “To call what we have now democracy is a perversion of language.” – The Dork of Cork. For sure, but when and where in history was there real democracy? Or alternatively, what is your model for real democracy? And if capitalism is antithetical to real democracy (which is what you seem to imply and I happen to agree) what should we replace capitalism with? My model of democracy is a functional rather then decorative one. If democracy ever happens much of the “Debate ” in parliament will seem even more pointless and certainly less dangerous. Certainly “Merry England” between the expulsion and Tudor times was a happier place but certainly no nirvana. I am no expert on ancient Greece but its “democratic” structure was certainly different , anyhow there was no PR inventions – the population at least knew officially who was owned and who were the owners – that is certainly not the case today as the owners drum up various religious battles that get the population “involved” in the debate as happened in Ireland last week. I would remind you no party represents the views of a sizeable section of the Irish population. The people are simply not aware of social credit and or agrarian distribution and its philosophy. The disidents get trapped inside the Venus fly traps of the both Jacobin Sinn Fein and the Marxist anti austerity alliance that will never enpower them as people. A Cork anti -paper with a working class readership today. “A CORK tax expert has warned tax-dodgers that there is nowhere left to hide as the Revenue becomes more high-tech. Cork-born Brendan Twohig of MK Brazil, Waterford, told a breakfast briefing that Revenue had switched focus to ordinary PAYE workers and increased their tax take in the process. People working cash-in-hand, understating their income, receiving payment from abroad, and those who haven’t paid their property tax have all been targeted. Mr Twohig advised businesses to plan ahead as non-compliance could have a huge effect. Cash payments keep local commerce alive in these non corporate little crevices of the Irish economy. The aim is to eliminate all cash transactions. To have total control of the economic grid. This is the anti state in action. A state divorced from its people. The people are the host , the state as currently contrived is the parasite. As the host begins to die the state attacks even the most vital organs used for independent life. The corporate nature of our society is extreme indeed. It wants to control all life. When I said “important decisions are still going to be taken by some group of qualified economists”, that is unquestionably true. For example economists will try to measure and quantify inflation and unemployment, a job which your average politician can’t possibly do. Economists will also try to work out to what extent inflation is cost push rather than demand pull – also beyond the capabilities of politicians. As for obviously political decisions like what proportion of GDP is allocated to public spending and what that’s spent on (education, health etc) that should obviously remain, as I’ve told you a hundred times, with politicians. But if you don’t like qualified economists doing the above sort of work then presumably you won’t like qualified engineers designing bridges, or qualified doctors tending the sick. I mean there are plenty of incompetent doctors aren’t there? And if you think economists are close to scientology than the truth, that accusaiton presumably also applies to yourself, as an amateur economist. Politicians should just do public spending ……….but what of natural resources ? Are they public or private ? Currently Ireland and Iceland burn through 25 % ~ of their oil ration on jet kerosene ( perhaps the highest in the OECD) by a wide margin. New Zealand ( the most isolated rich country in the world) as of Feb at least burns 15 % of its ration on the stuff. The resource costs required to keep these model open economies open is gigantic per person . Ireland inc is giving up control of its airline to other corporate bodies. It has given up socialism or official capitalistic management to unelected bodies. Ireland was /is a corporate farce but at least they have taken off the mask. Prepare for a future ” market failure” that will deprive Ireland of $$$$. Economists aren’t even in the same universe as engineers, never mind the same league. I don’t want ‘qualified’ economists deciding anything for the same reason I don’t want ‘qualified’ priests deciding anything. Governments have lots of civil servants whose job is to be knowledgeable in their field, work together with the elected members and execute what the elected members in the end decide. The elected can be voted off while the civil servant can be sacked if he/she is considered being incompetent, refusing to execute or collaborating with elected members. No reason at all why that wouldn’t work when it comes to economics. As a civil servant, and putatively an economist, I have to say to those who think “government economists will try to measure and quantify inflation and unemployment”, WRONG AGAIN! You don’t need economists for either of those tasks: you need competent mathematicians, statisticians, and actuaries. The calculations performed by statistical offices around the world are rarely done by economists!!!! It is true that even neo-classical economists have something to offer in terms of policy development, in thinking about trade-offs in investment. But there is no need for a coterie of economic Jacques (like Attali or Delors). Instead we need to take our cue from la Grande Jacquerie of 1358 — today is its anniversary, I think. Thomas, the Jacquerie anniversary, according to de Vericour in an article in the Transactions of the Royal Historical Society, was on the 21st of May 1358, not today. But good of you to bring it up. I see nothing like it on the horizon, no matter what gimmicks to entrench their power the moneyed elite seem to come up with. The situation seems to worsen almost by the week. I agree with Neil on who shouldn’t be in decisions-making positions, economists. They should function as civil servants and that is all. This discussion reminds me of Fred Hoyle advocating, in one of his novels, that scientists should be running the world, that they would make a better fist out of the job than the politicians. My reaction to this suggestion was one of incredulity. And this was when politicians were generally not yet “professionals”. Maybe he was influenced by Dragnet — just give me the facts, ma’am, just the facts. Neoclassical economists don’t even have these, so, Thomas, I don’t see what they have to offer at all. Their principles don’t square with reality and, hence, they don’t have command of the facts they could have. So, when Jack Webb qua Sgt. Joe Friday comes calling, they will have nothing useful to tell him. I left out the parentheses around the 1358 date. Supporting Neil’s contention that neoclassical economists function more like priests is a post from Ilargi Meijer recently in Automatic Earth (yesterday, in fact)– Austerity, Economics and Religion: http://www.theautomaticearth.com/2015/05/austerity-economics-and-religion/. While the post is primarily about the Troika aka Triumvirate, the thesis is easily generalizable. As a slight digression on what Neil said about the EU model, if we add in the consequences of signing up to the proposed US trade agreements, it might be best if the UK were to leave Europe should the Europeans sign up to this rubbish. At the moment, Merkel isn’t convinced, though the big guns from the US are trying their best to convince her that signing it will bring in the best of all possible worlds. The one for Asia has just been fast-tracked by the US Senate. Strangely, or perhaps not so strangely, the Tea Party is against this set of treaties, as they take power away from elected representatives in the US, and foreign governments in principle, in favor of corporations, wherever they are. Corporate values will trump local sovereign law in these treaties. While it is true that any foreign sovereign government could walk away at any time from such a treaty, what are the chances of this happening once it has been signed? Do the secretive machinations surrounding these treaties render Obama a more dangerous president than Bush? Its much more then economic morality. As happened in Ireland last week – if you don’t vote according to our sexual moral code we will stop the flow of credit. Where did the 41 billion of Swiss francs lost by the Swiss central bank turn up? Is it in the treasure chests of the financial elite? I don’t think N.W. distinguishes between neoclassical economists and ‘others’? If they’re worse off depends who you ask. Just to be clear, social conditions in Venezuela was much much worse before the Chavez-Maduro era. Venezuela has had problems with inflation since early 1980s. In the 1990s inflation averaged 50 percent per year which Chavez government got down to 22 percent per year and at the same time poverty was sharply reduced. One major problem for Venezuela causing their massive inflation is that 30-40 percent of all that is legally imported is immediately smuggled out from Venezuela making to much money chasing to few goods. They’ll have to address that one way or another. I’m not disputing that inequality and injustice fuelled support for Chavez, but Venezuela’s inflation has now been above 60 percent for some months, and the country has the second highest murder rate in the world, after Guatemala. It is reported that the goods you mention are smuggled out because the price controls mean they command a better price on the black market or overseas. And then there are the 33 mayors that have been imprisoned (are they out yet?). The Venezuelan oil industry was nationalized in 1976, and Chavez put in to very large extent back into the hands of the large multinational energy companies. Don’t know where you get your reports from, but it seems very much in line with what the opposition in Venezuela is saying. What is the relationship between the exchange rate peg and bank credit? Why does the exchange rate peg cause a credit crunch? Commercial power is highly centralised and like inflation can be forced onto a population to destabilize it and bring about social unrest. The same is occurring in Argentina, where the government has also restricted access to foreign exchange. Anybody who thinks otherwise has never lived in Latin America, or if they do, have a political and economic interest in the return to the old ways. And it is perfectly possible to just buy all the watches, etc exported and distribute them amongst the population. Yet because this is not “exports” it is ignored and fiscal policy remains too tight. Mad. It doesn’t. The removal of the peg would do as the exporters will go bankrupt and the economy may crash. Dan: I have lived in Latin America, and I do not dispute anything you are saying. However, I think, instead of grand ideological posturing, seeing things in black and white, good guys and bad guys, it is important to try to look at each case independently. It is all the more important to do so if you are progressive, not to whitewash putatively progressive governments just because they are “our guys”.